I was thinking about steelhead this weekend–they are still quite a ways off but it is hard not to think about them from time to time. Things look optimistic for this fall; the reports from the big lake are pretty good and the fish are abundant and healthy. 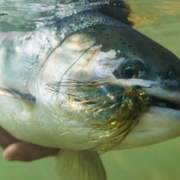 Another indicator that we have about steelhead is by looking at the summer steelhead. I spend most of my time on the Muskegon, and though we don’t have a sustained summer run, we do get stragglers. 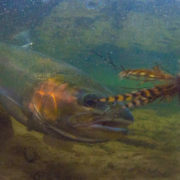 This year stragglers have been big–this is another indicator of health of the steelhead in the lake. This spring, we had a period of high water, and I spent my time when the river was flooded photographing steelhead that had moved up into tiny springs that were now swollen. The photos of these fish can be found here. 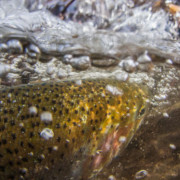 You think that steelhead are an awesome fish and then you watch them go through water that seems impassable and realize they are even more amazing than you once thought. Eventually their mission is complete, fry hatches, and the life cycle continues. Those fish that were hatched in these tiny streams have a better chance of survival. The water in these small streams is cold all year. Thanks for looking and enjoy the rest of the summer! Each spring, the river floods, and at some point I have a few days off. It is not that steelhead can’t be caught on those days. 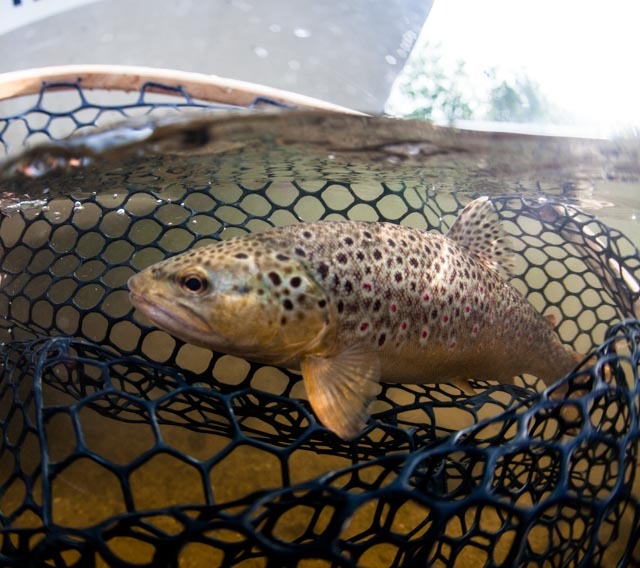 Fly fishing, however, requires that the fish see the fly and if I don’t feel that this minimum requirement can be met, cancellations are the likely result. Steelhead are of course a great gamefish. They are my favorite fish. 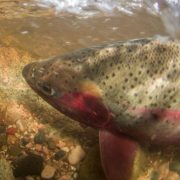 I also have a tremendous respect for steelhead and other salmonids as they migrate. They really do amazing things as they traverse rivers big and small. 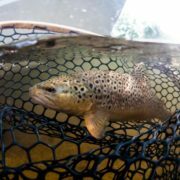 When I had some cancellations last week, I visited several small streams and witnessed these marvels of nature working their way up river. Steelhead take advantage of small creeks when they are flooded. As soon as this tiny, tiny creek became high enough for travel, up came the fish in droves. 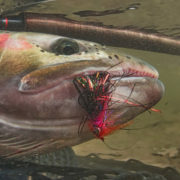 In any creek, steelhead take advantage of breaks in the current. In fishing terms, these are snags. 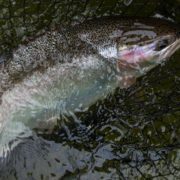 Steelhead love structure just like any other fish. They need the structure for protection in small places but they also need the break in current that these provide. In this stream, a series of tiny water falls existed. I did not see the steelhead leaping over them, but they had definitely been clearing them, most likely at night. The fact that there was little water in the stream was not an issue to these fish at all. I saw some fish temporarily stranded as they worked their way through the shallows. Steelhead are a precious commodity, this year more than ever. 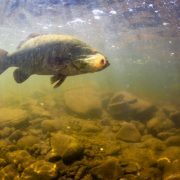 The Great Lakes fisheries are in a period of change, with the decline in baitfish populations and the subsequent increased pressure on other species, such as steelhead. Now more than ever, they need a little respect. This means protecting the fish while they are in the rivers, and protecting them on the small scale even as we fish and handle them. They deserve it!